Once upon a time, there was a cat named Lizbeth, who was borned in York, England. She lived with a big Norwegian family who moved to her town and found her in an old police helmet, just in the corner of a street. The father took the little cat and named her Lizbeth for he had been reading a book about the Queen Elizabeth II. Then, he bought some flowers and appeared at home with the cat. His son James was so happy that the day after he hadn't done his tasks, so the teacher became very angry, for even his notebook was full of tiny little catprints. He thought he was going to be punished, but the teacher smiled and nothing happened. The cat was very happy, as much as the family. Lizbeth's mother used to come and see her daughter until she passed away (because cats' lifes are shorter than our lifes) and she meaoww: 'ok, my cattie's fine there, wouf-miaow!' - She used to say. One fine morning in the summer, they all went to Gran Canaria, in the Canary Islands, Spain. Lizbeth had a very moved and bad trip, so she had to rest in Playa del Inglés for two days, after arriving there! The long summer was splendid. They went to the beach, run, ate fresh fish and lied on the grass near the appartments they were staying. Lizbeth also loved to lay on the warm sand and watch the birds in the afternoon, before reading Tolstoi, Albert Camus and Oscar Wilde, for she was a fan of the Literature and sports' books from all over the world. But one night it had to happen, yes, it did. She met a Canarian big blue cat which came from the mountains and became in love. She visited his boyfriend's house and didn't notice about the time (because time is different for cats and dogs.) His name was Stu (from Stuart) and was a very polite cat. In fact, no one of them had notion of time and they were chatting and jumping for about two months. Then, Stu had to go to Las Palmas for new fresh fish and Lizbeth went back to the appartment, but the family had gone! She found an old German call Henry who told her she had to live in a box. A decade after, she was older, a bit sick, but still the same. Lizbeth came to see me one afternoon at about 1'00 o'clock. She didn't want food, just me to say hello and to have a sun tan while I wrote my story about her. You can see her in the pic below. She is fine -she says-. P.S. 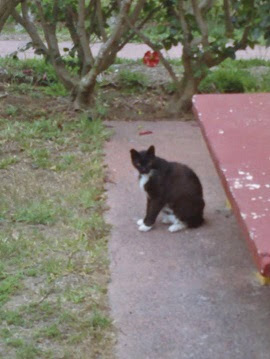 : Actually, this cat came to my door in the afternoon. I think she was a female. She didn't want to eat but to be pampered and have sun near me. READ MORE about this story pressing on "read more" below! !